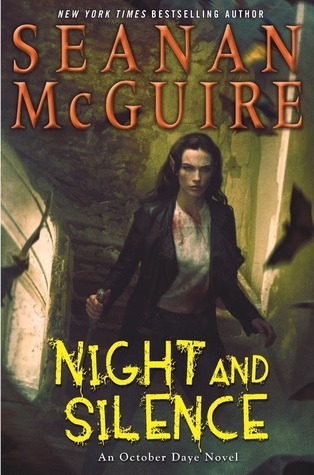 Night and Silence is the twelfth book in the October Daye series. As always, threads the reader may not have realized were left dangling in prior books are picked up and woven into something else new and dangerous for Toby and her friends to deal with. We see more of Faerie's denizens here, and the Changeling community that was left in ruins. The breaks in Toby and the others after the fallout of the last novel are evident, especially in the beginning of the novel. She has to work through them in order to piece together the reasons for Gillian's abduction; Toby feels less like a private detective and more of a woman that stumbles across a path laid for her by those more devious and vicious than she deserves to have to deal with. Her specialty is blood magic, and poor Toby has to spill quite a bit of her own over the course of the journey she takes to find Gillian. There's a small afterward that does deal with Gillian's point of view, which is rather important to me given that the series is told from Toby's perspective. She was something of a cipher and holy grail of sorts in earlier novels, but now Gillian is in college and trying to forge a path for herself. The events in this book, particularly those at the end, throws everything into upheaval. I'm sure that she will play an important role in future novels, so I really wanted to see her state of mind and how she would cope with everything. The Daye family seems to be cursed with dramatic events, after all, and I know Toby will soldier on. It's a new experience for Gillian. There are even more family secrets revealed and unraveled in this novel, something I didn't think was even possible after all of the other revelations that had occurred in earlier novels in the series. This poor woman has gone through so much; some of the highlights are mentioned in this so that newer readers can dive in and keep up. A number of the shocking revelations of prior novels are dealt with as no big deal here, so going backward would lose its punch a bit. It would still be a surprise in how it's revealed, so it's still worth it to go back and re-experience the series from the start. These aren't nursery rhyme fairy tales, but stories of the bloody and terrible cost that magic can exert on those that would wield its power. Those are the best kind, in my opinion, because we can really see the reflection of our world through theirs, and how we can learn from their mistakes.